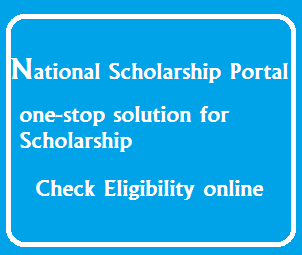 Everybody know National Scholarships Portal (NSP) is One-Stop Solution for apply scholarships online, Overall Indians can apply their Scholarships through https://www.scholarships.gov.in, NSP providing Various Services, Starting from student application, application receipt, processing, sanction and disbursal of various scholarships to Students are enabled.National Scholarships Portal is taken as Mission Mode Project under National e-Governance Plan (NeGP).National Scholarships Portal under the National e-Governance Plan aims at providing common electronic portal for implementing various Scholarships schemes launched by Union Government, State Government and Union Territories across the country. 1. Very Simple for apply Various Scholarships online for the Students. 6. Duplicates can be reduced to the maximum extent, Helps in standardisation. 8. Only One Time Registration is Required.don't required Registration Remember. 10. Scholarship Amount Transfer students directly into their bank accounts, through the process of DBT (Direct Benefit Transfer). Than click on "Services" on Main menu. Click on "Check Scholarship Eligibility"